Check out our suggestions for where to visit in Portugal based on your travel style. 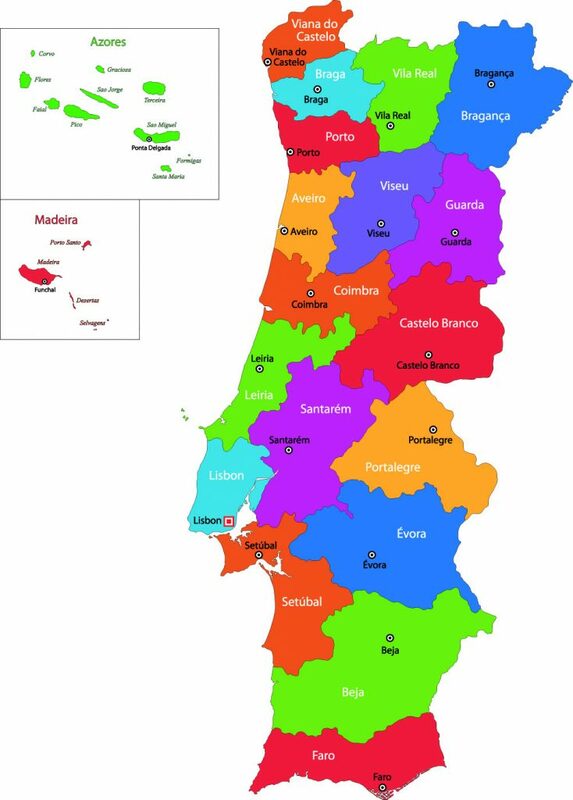 Scroll below to learn about Portugal by region. ⭐ First Timers Wanting to Hit the Must-Sees. If it’s your first time visiting Portugal, start with a few days in Lisbon. Add on a day trip to see the castles in Sintra or hit up the local beaches by heading to Comporta or Cascais. If you have a few more days, head to Porto for more culture or fly south to Faro to dip your toes in the ocean and relax on miles of beach. 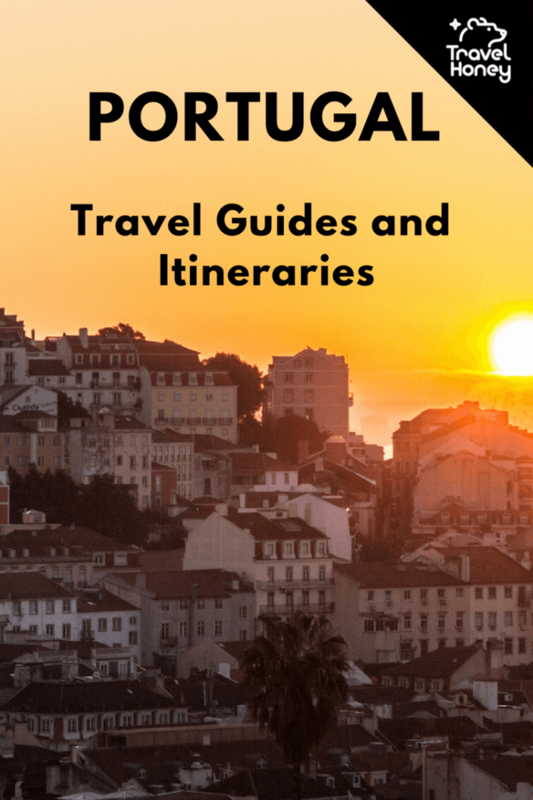 Check out the Travel Honey Portugal Itinerary. Portugal’s best beaches are in the southern Algarve region. Fly into Faro and choose your adventure. If you’re short on time, visit Comporta, about an hour drive south of Lisbon. Here is the Travel Honey Algarve Itinerary. Keen to get outside? Madeira and the Azores offer tons of spectacular hiking, biking, paragliding and fishing. Get the inside scoop on being active in Travel Honey’s Sao Miguel Itinerary, Pico Itinerary and Madeira Itinerary. If you love wine, spend a few days visiting vineyards and wine tasting in the Douro Valley. Here’s the Travel Honey Douro Valley Itinerary. The best and most varied shopping is in Lisbon, see our Lisbon Itineraries for the best spots. There is delicious food all over Portugal. For the best seafood, head down to the Algarve. For amazing meat and wine, eat around the Douro Valley. If you’re after Michelin stars, there is no better place to start than Lisbon and Porto. The Azores – these amazing islands are a 4.5 hour direct flight from Boston. We cover Azores in our Sao Miguel Itinerary and Pico Itinerary. If you’re not near Boston, there are a number of direct flights to Lisbon. You don’t lose very much travel time if you do an overnight flight to the islands because you gain hours on your way back to the U.S.
Spain is the obvious bet, because it’s next door. TAP airlines offers up to a 3-day stopover in Lisbon at no charge. Try the islands in the Azores other than Sao Miguel, like Pico Island. Mainland Portugal is roughly 3.5 times the size of Massachusetts and can be broken up into 5 regions. If you want to know where to visit in Portugal based on popularity, the three most visited destinations are greater Lisbon, north to Porto and the Douro Valley, and the Algarve along the south coast. Portugal also has two autonomous regions: Madeira is an archipelagos off the coast of Morocco and the Azores is an archipelago off the coast of southern Portugal. Central – Starting just underneath Porto, this area is diverse and filled with spa towns, forests and vendors of traditional handicrafts. Greater Lisbon – The capital is located on the coast, in the central part. Alentejo – The southern-central part of the country filled with sleepy villages, cork trees and olive groves. It’s hard to decide where to visit Portugal by time of year, because it can be great year round! But the best weather in Portugal is anytime during the spring, summer and fall. The weather is chilly and more rainy during the winter, but you can get more than just glimpses of sun. The winter is also the perfect time to go to avoid crowds and get the most bang for your buck. In the summer, head for the beaches of the Algarve, Cascais and Comporta when the average daily highs reach the upper 70sF. You can also catch hydrangea season in the Azores from late May through August. Just beware that everywhere in Portugal is busier in the summer. 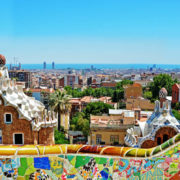 It’s also a popular weekend destination for Europeans, so if you want to find deals and less crowds, especially in the cities, try mid-week. If you’re going during a peak time, which is generally the summer and weekends in the major towns and cities, or want to stay at a small hotel or AirB&B, consider reserving a room with free cancellation as soon as you know possible dates – at the least you’ll have a back-up. You should also make restaurant reservations for popular restaurants during peak times. Fall and spring are the perfect time for outdoor activities and thus the best time to visit the Azores, Madeira and Douro Valley (especially during the harvest season). Lisbon and Porto work well year round. The average temperature in Lisbon is 75F in July and 52F in January. No matter where you’re planning to visit in Portugal, if you’ll be in Portugal for under 90 days, a visa is not required for U.S. and most European citizens. From the U.S, your passport must be valid for at least three months beyond your planned date of departure and you must have two pages for each entry stamp. Additional information from the U.S. State Department about Portugal, including travel requirements, is located here. Currency: Regardless of where you visit in Portugal, just know that it’s all on the Euro. ATMs/Credit Cards: Our advice is always have a stash of cash on hand. Fancier and bigger establishments and those around touristy areas, usually take credit card but not always and often not American Express. ATMs in Portugal are fairly common but are less prevalent (and sometimes run out of cash) in more remote places like the smaller islands of the Azores. Money saving tip: Drink Portuguese wine. Vinho Verde is especially tasty and you can often find a bottle on the menu for around 10-15 euros. Locals eat all their meals later than in the U.S. Typically, hotel breakfasts don’t start until 8 or 8:30 and restaurants don’t open for lunch until 12pm (locals eat around 2pm) and dinner until 7pm (locals eat after 9pm). Bars don’t get busy in cities until after 12pm and they go late. Meals are not a rushed affair, so if you’re in a hurry, let your server know. Restaurants do not ask if you’re ready for the check and will only bring it if you ask for it (say “A conta, por favor”). Meals are a lot cheaper than in the U.S., especially if you drink Portuguese wine. Like in most European countries, you’ll also get served free snacks with your drinks (nuts, chips, etc.). But restaurants often charge for bread and will not serve tap water (even though it’s safe to drink), requiring you to buy bottled water. At less fancy restaurants you’ll often see a list of fish, but they only have the fish that’s caught that day. If you like tuna very rare, I’d recommend showing a photo of how you want it cooked. Take away coffee is hard to find, so do like the locals and sit (or stand!) and have an espresso. You can also decide where to visit in Portugal based on food! Portuguese regions, even cities and towns, are known for specific food and drinks. These are noted in each Travel Honey itinerary, but we’ve listed some must tries anywhere you go! Seafood is amazing wherever you go near the coast, but some local favorites include: octopus, bacalao (salted cod), codfish fritters (bolinhos de bacalhau or Pastéis de bacalhau) and limpets. Also try the fish of the day, which usually split in half and grilled. Chouriço – a flavorful pork sausage often served flaming! Stews (cozidos) – especially in the Azores where they cook them in the ground. Whatever pastry is famous in the area (like Pastéis De Nata in Lisbon). Portuguese wine – a variety of wines are made in Portugal and they’re generally cheaper than imported wines. Try the Vinho Verde, which is the name of a region of Portugal where the wine grapes are grown. Port is also commonly produced in Portugal, especially the Douro Valley. A cold glass of Sagres and Super Bock, the local Portuguese beer. HOW DO I USE MY CELL PHONE IN PORTUGAL? Get a SIM card, it’s super easy and the service is good. Vodafone has a holiday SIM with 5GB of data, 500 min. Local calls/texts and 30 min. calls/texts to the U.S., Canada, Australia, Brazil and New Zealand. There’s also a 1GB option for 10 euros that only includes local calls/texts. They both last for 30 days. Read Should I buy a Portugal SIM card for more information to make your decision. As you’re deciding where to visit in Portugal, brush up on books, movies and tunes from Portugal! Read selected prose of Fernando Pessoa, one of Portugal’s greatest writers. Watch “Blood of My Blood”. The movie tells the tale of a blue collar family living in suburban Lisbon. Highly acclaimed at several international film festivals. Listen to anything by Sam the Kid, star of Portugal’s rap scene.